You’re probably wondering why I made the title of this post so specific as study materials are mostly universal. Okay, maybe I’m just projecting my own thoughts on to yours. 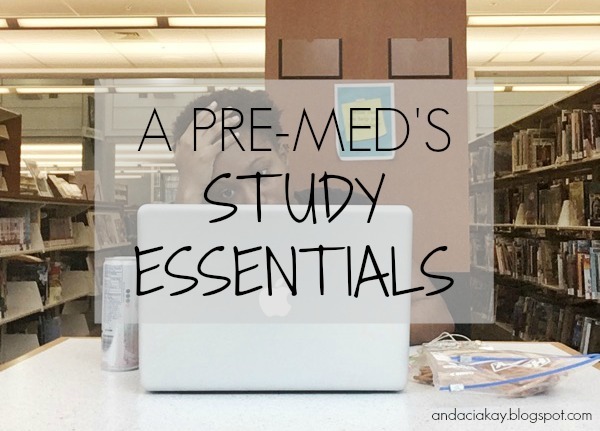 Anyway, when I was writing this post I recalled that a few (more like one) of my study must-haves were kind of unique to my field of study (premed, obviously). In other words, I definitely couldn’t see a Pre-Law student absolutely needing the thing(s) I need when I study. Well, how about I stop yapping about it and get to the post, yeah? A Plan: What’s the focus for the day? Are you going to need your calculator? I normally plan out my study days using to-do lists. When I’m making these lists, I have my planner beside me where I can see the things that I went over in class that week or that I have yet to cover. You don’t want to go into your study sessions blind sighted, you know? Class Material: Okay, so you have your plan, right? Do you think you’re gonna need the textbooks to study for that class? Bring them. Do you have a printed version of the lectures? Bring them. What about the math work sheets that are dripping with practice problems? Yes, bring them too. If you’re studying outside of your dorm, make sure you’re prepared. Heck, you should even bring your syllabus just in case you’re planning to read ahead. Printer Paper: I only use this for math because lined paper seems so restrictive. I can mess up as many times as I want as there’s plenty of space for trial and error. iPad: The more screens the better. I use my iPad to pull up lecture slides, this allows my laptop to be used for something else. Phone: Staying in the dorm? Turn it on Do Not Disturb or put it (far) away. Elsewhere? Do Not Disturb will do, but make sure you check for missed calls/texts during your periodic study breaks for good measure. Laptop: I was considering leaving this off the list because it’s a given, but it’s just too important. I know libraries are equipped with computers, but there’s nothing like having your own. Medical School Parodies: Are you serious? Yes, I’m serious. I’m one of those people that have to study for five hours straight before they’re actually satisfied with themselves, so the medical school parodies are important to give me a little more motivation. Oh, how could I forget?!? Food! : Have you ever sat in the library to study and worried that you didn’t bring enough snacks? No? Okay, maybe no one’s as dramatic as I am… I accept that. Still, I think snacks are essential for any study session. Previous Post “Andacia Kay” is a Year Old! !